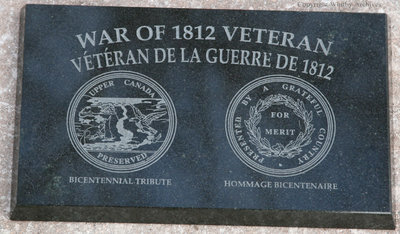 A colour photograph of the War of 1812 dedication plaque in front of Samuel Cochrane's gravestone in the Society of Friends' Cemetery, Ajax, Ontario. Samuel Cochrane (1793-1879) was born in Bakersfield Township, Vermont, U.S.A on 29 June 1793. He moved to Whitby circa 1812 and married Deborah Powell (1795-1862) on 4 April 1815. They raised a large family of 10 children: Smith (1816-1846), Henry (1818-1846), James Powell (1820-1889), Caroline (1822-1898), Clarissa (1824-1812), Abram (1826-1896), Phoebe Ann (1832-1834), Elizabeth (1835-1912), Samuel H. (1837-1872) and William Maurice (1844-1900). After the death of his first wife, Deborah, Samuel married Mary Carpenter on 14 October 1863. He died in Whitby on 14 July 1879 at the age of 86. An “e” was added to the surname Cochrane at some point. During the War of 1812, Samuel was drafted twice and volunteered once; he saw action in the battle of Detroit. He would later draw a pension for his service in the War of 1812 at the age of 82. On 18 December 2013 a ceremony was held in the Society of Friends' Cemetery in Ajax, Ontario to commemorate Samuel's service during the war of 1812. He is the first Durham veteran to be honoured with a plaque at his grave. This honour is part of the War of 1812 Graveside Project sponsored by Heritage Canada. Samuel Cochrane War of 1812 Dedication Ceremony, December 2013, Megan Pugh. Whitby Archives D2014_002_004. Uploaded from a digital file.